Bridal gowns are the most important purchase a woman will make. 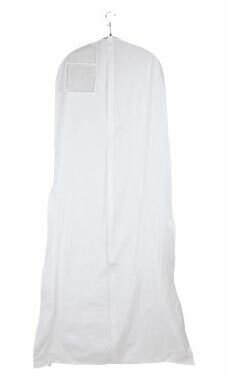 With our heavy duty vinyl white bridal gown covers, it's easy to keep your store's gowns protected. Featuring a full-length zipper, it's easy to place gowns inside of the bags, and to remove gowns from the bags, without wrinkling, damage or tear. The white vinyl bridal covers are made with sturdy seams for durability, and feature a reinforced hanger opening, which is great when transporting expensive gowns. All gown covers feature a document pouch to hold work/sales tickets and manufacturer information. Measuring 72" in length, 23½” in width at the top, and 36" in width at the bottom, nearly any bridal gown will fit inside the cover. 3 gauge thickness.